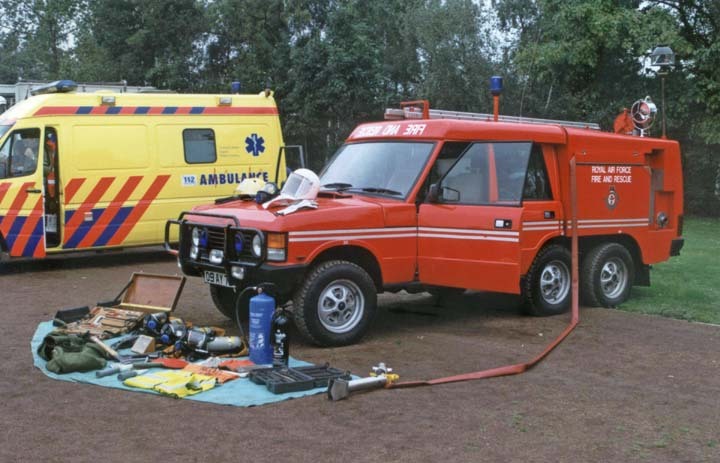 A Range Rover from the RAF Fire and Rescue service. It's a Range Rover TACR. Very nice picture of this classic vehicle. Good display of equipment carried. Added by Walter Davis on 24 January 2007. Looks like 09 AY 78 has survived in preserved condition from RAF Laarbruch? Added by Walter Davis on 25 January 2007. Maybe, looking at the picture date, it's still in service at the time? Added by Walter Davis on 16 July 2007. It is a classic and a smashing picture, we used two in South Yorks during the 1977 strike as BA and rescue machines, they were considered dangerous by some traffic police who escorted us due to their body roll in traffic. Once you new their limits it was fine, just glad I didnt have to pay the petrol bill! Added by John Stott on 29 September 2008. Added by Joe B on 19 February 2009.